Welcome to Willow Class school blog. Read about what we have been up to in class. Miss Dawson held a parents information evening about SATS after school tonight. Here is a video that she showed parents, which explains what SATS are about for Y2. Click on the video below if you would like to find out more. What makes our world great anyway? We can get food and water in our world to keep us alive. We have big oceans and seas. We have the sun to keep us warm. We have friends to play with. We have lots of countries and languages. Did you know that Jill Murphy wrote The Worst Witch? We are doing an author study in Willow class and will be reading lots of her books, including the Worst Witch. We have been chatting a lot this week about the kind of things that witches would do. We spoke about how a witch would cast spells, make potions, fly a broomstick and stroke a cat. Then we pretended to be a witch and do these things in the playground. Mildred is the main character in The Worst Witch and she likes to chew her braids, so we pretended to be her too! 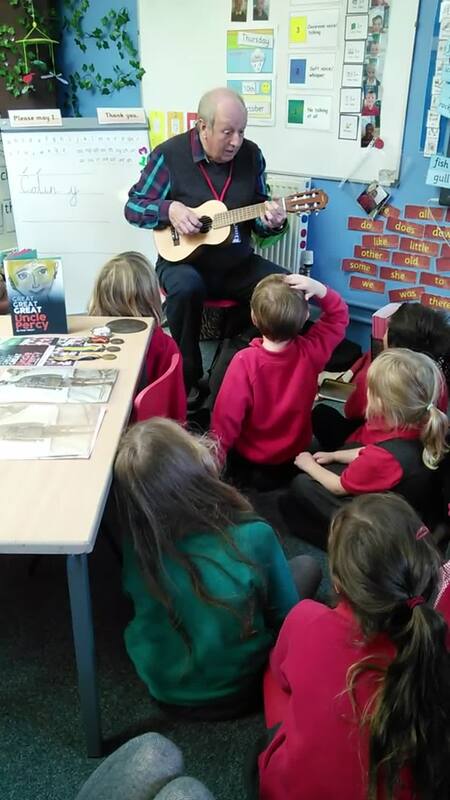 Today Mr. Gilbert visited us and told us all about Percy. He fought in WW1 and Mr. Gilbert has written a book about him. Percy was Mr. Gilbert's uncle. He told us all about his life and he even showed us some of the things that he has, which belonged to Percy. We found out about how the world was very different when Percy was alive. Percy had to fight in the war, go outside for the toilet and have a wash in the sink. He had a prayer book that he took to war with him and a Union Jack flag. 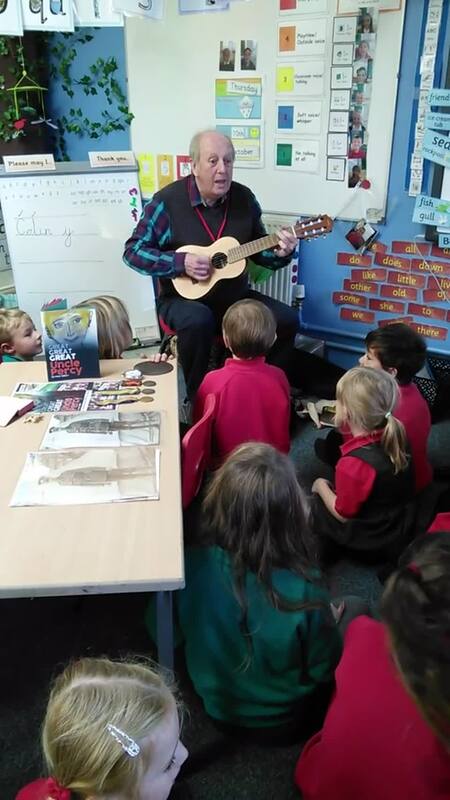 Mr Gilbert even taught us a song that Percy would have sung and then we all sang a happy song together. We loved it! 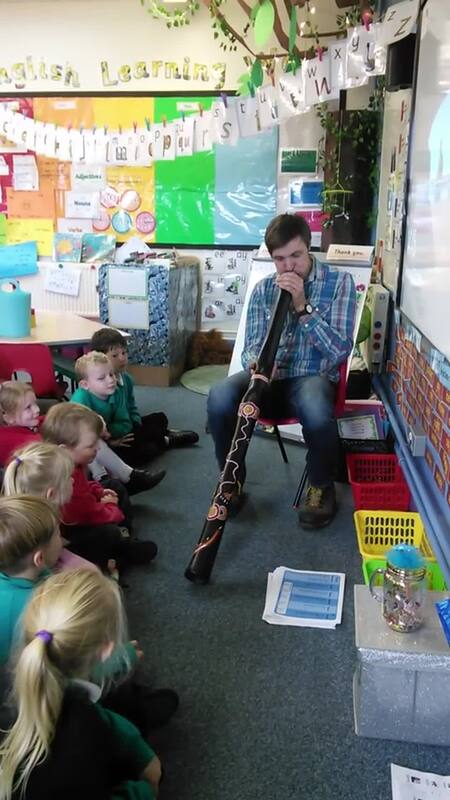 Can you play a didgeridoo? Today we had a visitor in class. His name was Mr. Abrahams and he visited us to play the didgeridoo! He used to live in Australia and he told us all about how didgeridoos are made. Did you know that termites eat the inside of the wood and that's what makes it hollow? 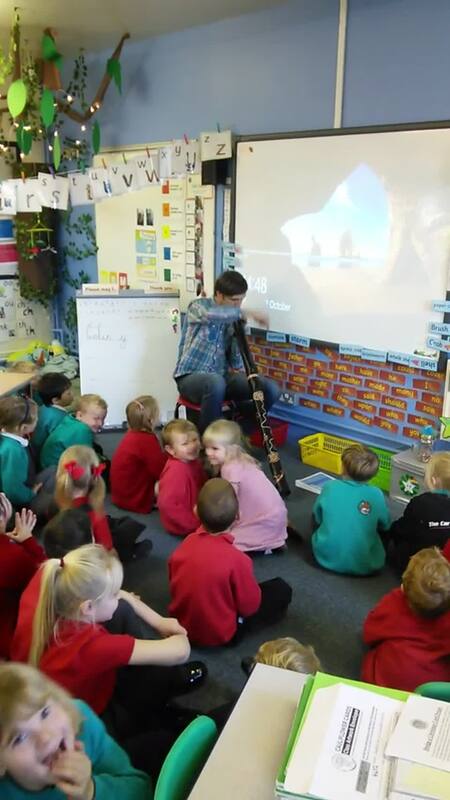 He played his didgeridoo and let us feel the vibrations it makes. He even let us have a go at playing it. It's much harder than we thought! Our topic this term started with a big question: Can one person change the world? We weren't too sure to start with, but we have been learning how Captain Cook changed the world by drawing maps and claiming Australia for Great Britain. Because he was a sailor, we wanted to learn more about the sea and what he would have perhaps seen on his ship, The Endeavour. We visited The Deep in Hull and we loved it! There was so much sea life to explore. In Y1 we have been learning about partitioning numbers into tens and ones. We have used Numicon and Base Ten to do this. We had some fun choosing numbers and matching them with words and materials outside. We were lucky too, because the sun kept shining! In Y2 we have been learning about how a number can be partitioned in different ways. We investigated different numbers with Numicon and found out that 37 is made up of 30+7, 20+17, 10+27 and 37+0. We had fun doing this outside in the sunshine! This term we are finding out if one person can change the world! We are learning all about Captain Cook. Have a look and see all the questions we will be finding the answers to this term. We are planning on doing a lot of Science in Spring 2! We will be looking closely at animals and their habitats. Please click on our homework sheet below to see what homework we can do around this. As always, we will have spelling, reading and maths to do regularly. There are plenty of ideas on other activities that we could do about animals and habitats too! Our Spring topic has started with a big question: What is so great about our world anyway? We had a think about this and decided on some questions that we would like answered. See what they are below. We are really looking forward to our topic. Here is a copy of our Spring 1 homework. Click on this to see what activities we can do for our homework celebration. Have fun! Here is a copy of our Autumn 2 homework. Click on this to see what activities we can do for our homework celebration. This is a copy of our final weekly timetable in Willow. This will let you see what we are learning about each day. This is our yearly overview 2018-2019. This will let you see what subjects we will be covering in this academic year.